We're expected to make a game by Christmas and to be extremely proficent in C++ by Christmas. It sounds fun. My C++ is rusty to the point of collapse. So I'm going to work through one or two of the C books I brought along. Then I'll find what are a few good reference books for C++ and order them. I want any articles I write to be in some kind of document source code and then the ones uploaded here are "compiled" to html. So I'm looking into docbook, but it looks very hard to set up. So maybe I'll see what I can do with a few latex plugins. And tomorrow lectures start. A year of game programming goodness. Today I've added some small bits of code to reset the vertexbuffers when the device is reset in the RenderPrimitives dll. Also polished off another chapter of the little schemer. Back to poking at my .Net code this morning. Seeing as I'm on a new computer I'm also going to see if blogger will allow me to upload photos, in the past it's always been quite fussy. I think that it's because I had firefox force any pop-up to load in a background tab. Well looks like it's working now! Anyway I thought I'd talk a little about DirectX devices and forms. This relates to creating directx fullscreen apps as well. When you create your device you create a PresentParameters object and this takes in two important variables; the height and width of your display area. If you have a form you might think - oh this is just form1.Width and form1.Height but you'd be wrong! That's the entire height of the form, including the blue bar with the maximize, minimize and close buttons, and the little grey border. If you use these values it will most likely throw some of your calculations off. One way round this is to put a panel in the form and then use panel1.Height, panel1.Width and this will work fine because the panel has no border stuff. Unfortunately it will fail horribly if you try to do fullscreen. To do fullscreen the component you use must be a form. So what's the best way to get the width and height? Well it's not to hard-code them, like I seem to have done on my project :D Rather it's to get them from form1.DisplayRectangle. This gives the area you can draw in and doesn't include any of the form fluff, like grey outlines and drop menu strips! Also looks as if blogger's actually going to show one of my images. This test image just shows how I use firefox and rss. 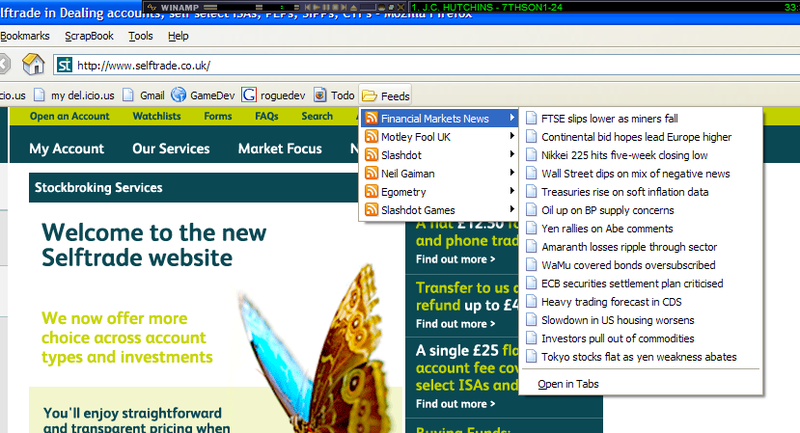 If in firefox you add a bookmark and put it in the "Bookmarks Toolbar Folder", it will appear as a button on a strip just above the window your currently browsing. Then you can press it and it'll take you to the relevant page. Great. If you add a bookmark to an RSS feed in the folder, a button will once again appear on the strip. But this time when you press it, it will form a drop down menu listing all the newest items in that feed (you can do that with this webapge by the way :D You'd get a list of all my latest posts with their rather cryptic titles :) . Even greater. Of course, if you keep doing this, that strip's going to get quite full! So you might want to add a folder within the "Bookmarks Toolbar Folder", this folder will also be represented as a button on the strip. Click the folder and it will create a drop down of all the links you've put in there. I like to have folder just of RSS feeds. 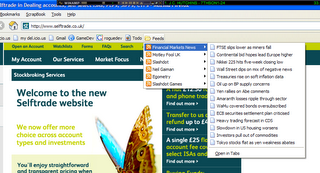 Then I can run my mouse down them and see if there's anything new on the webpages I'm interested in. If you've read this and you're thinking, "I don't know what RSS feeds are :(", well, well done for reading it all :D RSS feeds are some XML files hosted on the webpage you're interested in and each time the page is updated, the xml's updated too. Then your computer periodically (every few minutes or so) queries this xml file and updates it's local listing of that particular pages updates. So rather than you manually checking for updates the updates are brought to you. EDIT: I think I've the found artifact problem, it seems to be due to the ratio between directx space and pixel size of the display area and textures. EDIT: I can't believe I was back again today battling with artifacts when rendering tiles GAH!! Anyway for what's it's worth it's fixed now. I made a new library with fixed spelling called Einfall.RenderPrimitives. Where I made one small change. But I think one of the main sources of artifacts occurs if your form.DisplayRectangle doesn't equal your othographic projection width and length. Currently I'm scrolling smoothly with batched unartifact tiles. So that's nice. I guess the worse thing was this worked fine before on my laptop :O I'm somewhat confident now it will work nicely on all systems. So now all I need do is rewrite my tight map project (which is basically a small tiled engine that uses batching, animation and layers.) and the artifacts should dissapear. Then once that's working nicely I'll have to merge it into Einfall which I guess will be a never ending serious of headaches. And then, then, I'll have einfall create buildings that actually have walls! Currently the buildings are merely flat outlines. Final Edit: Quick bit of tinkering and tight map is now compiling as expected. Up to chapter 4 in the little schemer now. It's interesting to see that most loops are actually done by using recursion ... and it reminds me of another programming language I was taught in University, probably prolog. I'm not finding the book too hard going and can work out most of the answers to the questions. But I never seem to get the brackets right (as Jani pointed out this is the intially scary thing about lisps) I'm always doing (cons (atom) (atoms)) where it should be (cons atom (atoms)). (>_<) I don't know any of the debugging stuff yet either. Here is my amazing second entirely homemade function that takes a list and replaces every atom in it with the word (unitialized variable) "spanner". Yay me. This article on stackless python is quite interesting, the comments are good too. Here's my first scheme (that I've written off my own back rather than copying from the text book) function it's very very simple. If you pass in a true value it returns hello, if you pass in a false value is return goodbye. Goodbye and hello aren't strings they're more like unitialized variables. Yesterday I played with the map editor program a bit more. I'm having trouble transforming the device for my various swap chains so that's something I need to play with. (this looks like a reasonable place to start) I also added a moving camera to my tile renderer to make sure there are no artifacts. It works fine. So I documented my simple rendering stuff - the RenderPrimitives library that handles batching. Time to find another suspect for the artifacts. So I'm still hacking away at the old map editor, DirectX is now playing nicely with windows forms. In fact this is such a useful thing to do that I may as well explain how (briefly). Using DirectX, C#, Windows Forms, to create a non-flickering interactive form application that also has a render loop for DirectX. Now there's a smooth, smooth title. /// Sets up a render loop so DirectX bits are updated as often as possible. Anyway, we've got this wonderful looping class let's see how we'd use it in an application. So we create a new form and that form has a render method. This is where DirectX does it's stuff. DirectX might be updating a panel or something, or maybe you want rotating 3D cubes on your buttons - whatever, this is where that code goes. We hook the form's Render method up the RenderLoop's Loop event. So the game loop now will call form1.Render each iteration. This is often called loose coupling, it's cool because I can use the class RenderLoop again and again in different projects, in different ways. Wow an actual post with some substance, it's been a while. Using the above code you could have a windows form which is partly directX. For instance a panel might show a £D model and by the panel are a number of buttons that make the model play various animations. This stuff is very useful for writing test programs and editors, or borrowing the Windows GUI if you don't fancy rolling your own. But today I've been fooling around with a map editor. (I'm currently not playing with Einfall so much because I need to install a paint program that can handle png alpha channels, this would take all of two minutes, but reading and gardens often seem to get in the way) Yes map editor, a long time ago, some one commented that they were anxiously waiting for another tutorial that would cover map editors. I confess at this point I have no intention of writing a tutorial. My program is very basic at the moment, a MDI parent window. MDI stands for multi-document interface, I think, basically what you'd be using if you used Photoshop - a window for a each picture you opened. Some my graphics stuff that worked on my portable didn't work when transferred over to the desktop. After having a bit of look it seems the problem was that I wasn't storing some of my textures in powers of 2. I've been puttering around in my resource code. It's quite nice to come back to after a break, as it's much easier to see dubious design decisions. My resource manager works around a very shallow inheritence tree, basically there are few types of bank, that manage the resources loaded into the game. All the banks are generic so they can hold any type of resource. The situation arises where you might ask the bank for a resource and it doesn't have it . For some reason only one of the banks deals with this situation in a decent manner. It calls an event, where the user of the bank would write a call handling the event and probably loading the missing resource from disk. There's no reason why all the banks shouldn't have this event so I'm in the process of moving it now and fixing things according to the unit tests. I'm trying to make my more mature code more solid, documented and polished.